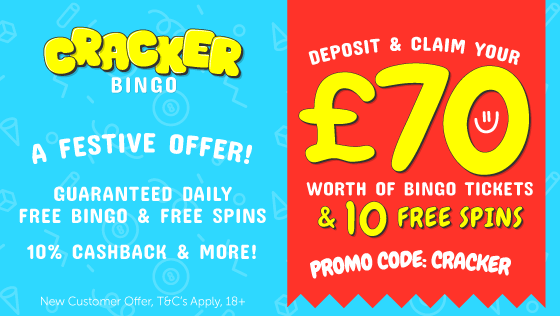 From the same team behind popular sites like Costa Bingo and Rio Bingo comes another gem of a site but purely focused on slot games. It is a great new addition to the fold and new players wanting to give it a try can get 10 Free Spins at Slot Crazy with no deposit required! The site has a very fresh and modern feel to it and has easy navigation with the minimal amount of clicks of your mouse, or tap of your finger, to be up and running playing the game of your choice. with over 150 games to be enjoyed, there is bound to be something for everyone. There are classic slots, progressive jackpots and casino games and add to this a VIP Club and regular promotional offers, it means Slot Crazy is a site well worth a look at. If you would like to get 10 free spins at Slot Crazy and give the site a whirl, then click either the claim button above, the link above, or the blue button below. Any of these will open up the Slot Crazy website in a new browser tab for you. You will then need to select the big Join Now button on their homepage to open up the online registration form. Complete the form in full including your banking details. Nothing will be taken from your debit or credit card as this is just for security reasons. Within ten minutes you will then have 10 free spins credited to your new account. Any bonus winnings from these free spins have an 80 x wagering requirement. 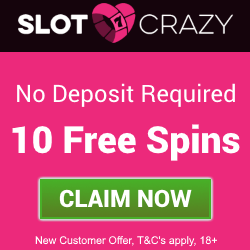 Once you have had a taste of the site and fancy a free signup bonus offer, use the Slot Crazy Login to access your account and make a deposit of between £10 and £100 and you will receive a 100% cash match bonus, worth up to an extra £100. You will also receive a total of 100 Free Spins over your first 27 days of play. 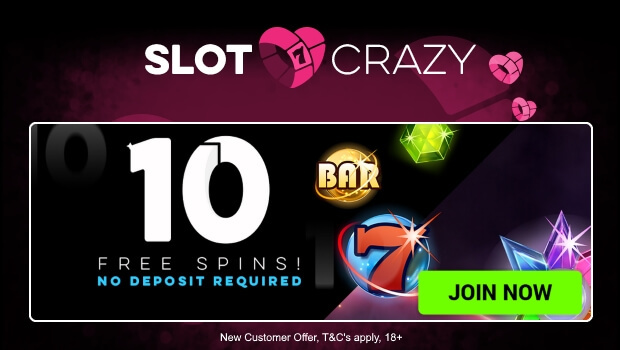 So give this great new slots based site a try and get 10 Free Spins at Slot Crazy today!